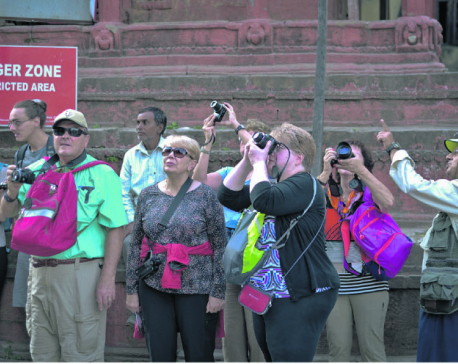 KATHMANDU, Dec 14: Mayors of three major tourist destinations of the country have unveiled their plans and strategies for development promotion of tourism in their respective areas. Speaking at the Golden Jubilee Valedictory Ceremony of Nepal Association of Tour and Travel Agents (NATTA) in Kathmandu on Wednesday, mayors of Pokhara-Lekhnath Metropolitan City, Lalitpur Metropolitan City and Ratnanagar Municipality presented the programs and activities that they have adopted to bring more tourists to their respective municipal areas. Narayan Ban, mayor of Ratnanagar Municipality, said that his municipality was planning to declare Sauraha -- popular destination in the country for jungle activities - a vehicle-free zone. “As animal right activists are criticizing elephant-back safari, we are thinking of introduce small vehicles for jungle safari,” he added. There are around 150 lodges and resorts, and 70 restaurants catering to tourists in Sauraha. “We have been welcoming around 160,000 foreign tourists in Sauraha annually,” he said, adding: “Now, will work to bring more domestic tourists to Sauraha.” Ban also added that the municipality will bring a policy that bans construction of buildings having more than two and half floors. Likewise, Chiribabu Maharjan, mayor of Lalitpur Metropolitan City, expressed commitment to complete reconstruction of quake-damaged monuments and heritage sites within three years. “As Lalitpur is popular among tourists for historical monuments and cultural attractions, we have to restore all these monuments as soon as possible,” Maharjan said, pointing out the need to preserve culturally-rich historic villages like Bungamati, Khokana and Harisiddhi, among others. Maharjan also unveiled plan to introduce entrance fee with 72-hour validity for foreign tourists in the near future. “We are just people's representatives. You, the tourism entrepreneurs, have more expertise than us. I assure you that we will work in coordination with representative bodies of tourism entrepreneurs,” he told the gathering. Also speaking at the program, Man Bahadur GC, mayor of Pokhara-Lekhnath Municipality said that the metropolis intends to develop Pokhara as a 'cycle city' to attract more tourists. “Our strategy is to promote 'cave to cave cycling' and 'lake to lake cycling'. 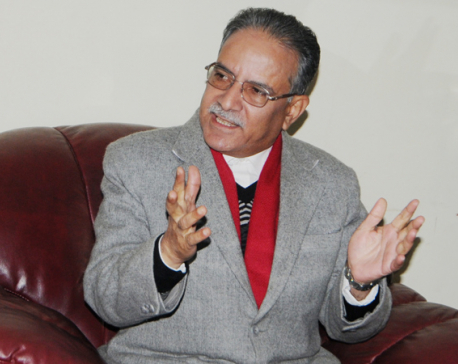 We want to see tourists, both foreign and domestic, enjoy the beauty of Pokhara by hopping on their bicycle,” he added. 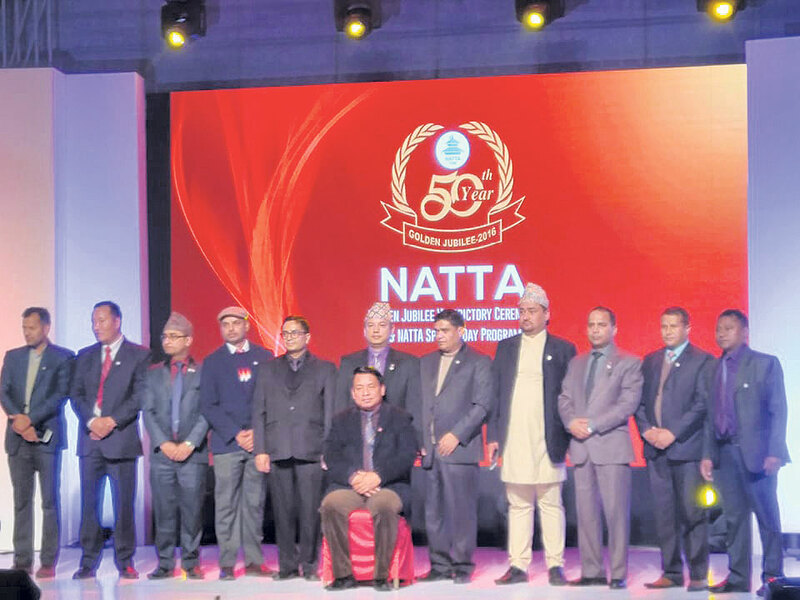 While the mayors requested the tourism entrepreneurs to support local bodies help develop and promote tourism sector, Vice President Nanda Kishor Pun requested the private sector to work hand in hand with local, provincial and central governments for tourism development and promotion. “Private sector is the major player in tourism industry. As the political transition is about to end, concerted efforts of the government and the private sector is needed to take more benefits from the tourism sector,” he added. Secretary of Ministry of Culture, Tourism and Civil Aviation Maheshwor Neupane, CEO of Nepal Tourism Board (NTB) Deepak Raj Joshi, Managing Director of Nepal Airlines Corporation Sugat Ratna Kansakar and country managers of Turkish Airlines and Qatar Airways, among others were present in the program. The Golden Jubilee celebration had started in 2016 with the theme 'Nepali Tourism: Industry of National Priority'.